What happens when you mix primary colours together? This is a really simple story that introduces children to the concept of colour mixing in a fun way and inspired us to get our paints out. The Story: Three white mice on a sheet of white paper are hidden from the cat. The mice find three pots of paint and climb in. Then they make paint puddles and when they put their coloured feet into the puddle it changes colour. When their fur starts to feel sticky they wash the paint off and then paint sections of the paper in six different colours (but they leave one part of the paper white so that they can still hide from the cat!). 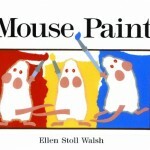 For a young child Mouse Paint is a lovely story, for an older child the story offers an element of scientific discovery and provides opportunities for learning. It is an easy text for children to follow, the sentences are short and simple and there is some repetition which makes it a good book for a beginner reader. 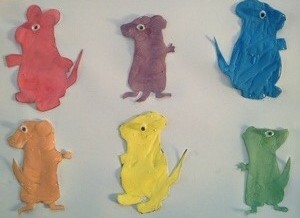 The mice are very cute and I like the pictures which are bold and colourful on a predominantly white background. I first used this book on teaching practice and have used it many times in Early Years’ classrooms for a topic on colour. It reinforces six basic colours and introduces basic colour mixing. My daughter wanted to mix colours like the mice so we had a lovely time making our own Mouse Paint mice which helped to reinforce the concepts introduced in the book. 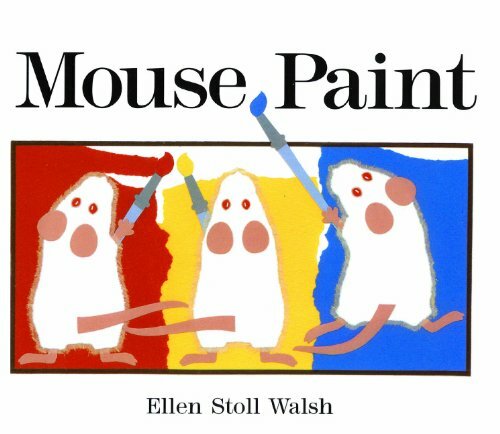 I have often used Mouse Paint to introduce colour vocabulary to non native English speaking children and have recently read the story to a group of four and five year olds to stimulate a craft activity. They chose two primary colours and mixed them together (using acrylic paint) in a small glass jar. Then they painted the inside of the jar and a paint stripe around the outside top before turning it upside down in a bowl of decorative sand. They finished decorating their tealight holders by sticking small ‘jewels’ to the outside of the jar. This really is a great book to use in the classroom as well as being an enjoyable story. You and your daughter produced very cute mice! Thankyou! She had such fun mixing the colours bit it was a good activity to consolidate the learning. This is fantastic! It turned out so well! I’m definitely going to have to try it with my son. What a great idea! Thanks for the post and for linking up to The Children’s Bookshelf. 🙂 You always have such good posts. What a great idea, I had forgotten about the Mouse Paint book, I’ll definitely order it for Ethan, we’re getting very into painting at our house 🙂 Thanks! I’ve not heard of this before and it sounds lovely. It’s an oldie but a goodie – first published in 1989.